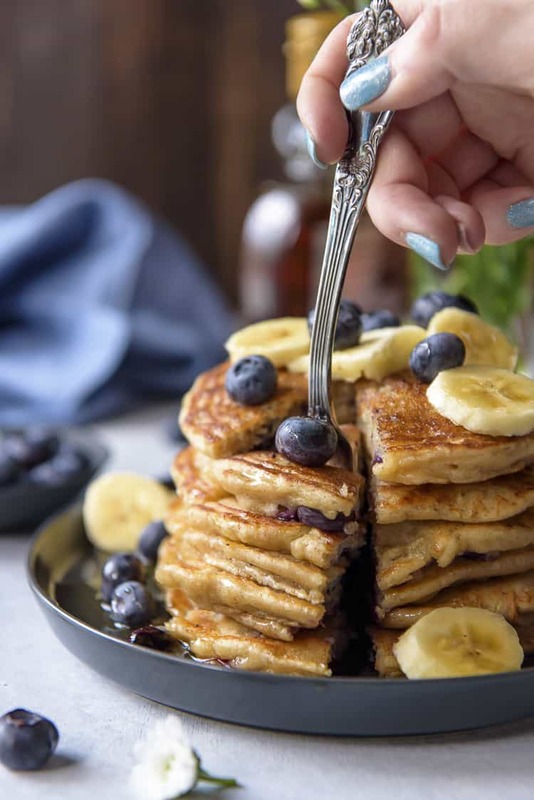 What really makes a weekend breakfast fabulous is a big stack of fluffy, homemade, buttermilk Blueberry Banana Pancakes! 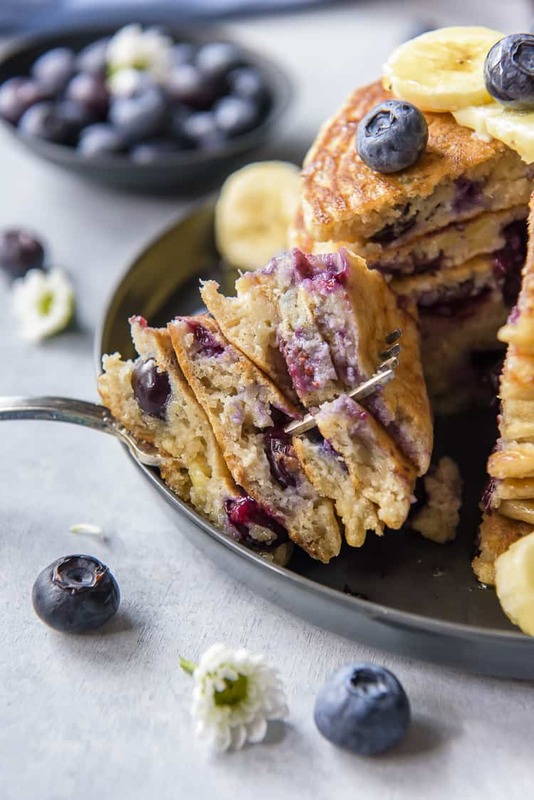 These irresistibly soft from scratch pancakes are loaded with ripe bananas and juicy blueberries are truly the best! Is there anything as cozy and comforting on a cold morning as a big stack of homemade pancakes? Bathed in and dripping with golden maple syrup. Flanked with a stack of crispy bacon. I mean, the bacon is optional, but in our house…it’s non-negotiable. JUST TAKE ME TO THE BLUEBERRY BANANA PANCAKES ALREADY! 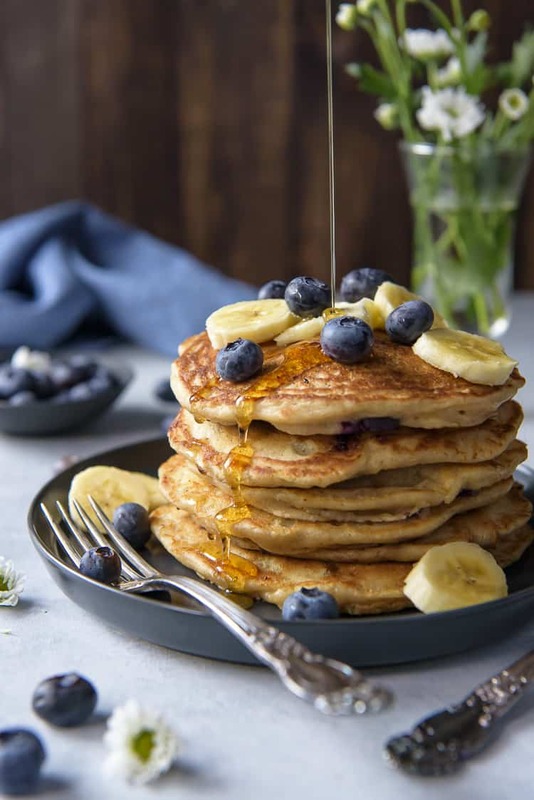 If you’d rather skip my (pretty darn helpful) tips and tricks, essential cooking info, and similar recipe ideas – and get straight to this deliciously easy banana pancake recipe, just scroll right on down to the bottom of the page where you can find the printable recipe card! So what do you do with brown bananas? More often than not, Abe and I end up with at least 2 or 3 gross, inedible dark brown bananas with every bunch we buy. Of course, this is intentional. I always buy extra so I have a reason to make banana bread, banana cake, or banana muffins! Until last week, I had no idea how absolutely delish these easy banana pancakes are. My buddy Lara and I were doing some client work, and one recipe happened to be a buttermilk pancake recipe. Of course, hers were loaded with chocolate chips so I went crazy for them. I decided years ago I would never make pancakes from a mix again. These buttermilk banana pancakes made me realize I will forever put smashed overripe bananas in there, no matter what. 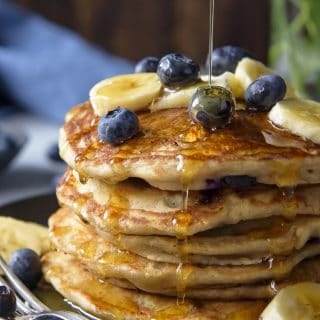 Are These Banana Pancakes Healthy? Sorry, friends. If you were looking for some 2-ingredient, low carb, gluten free flapjacks, you’ll have to look elsewhere. 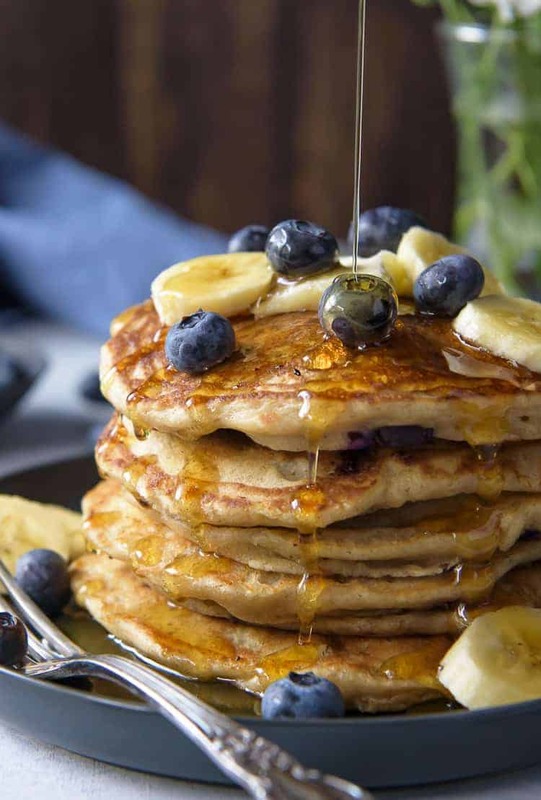 These banana pancakes are flour based, and are made with granulated sugar and buttermilk. So while they’re not keto friendly, a couple of pancakes is just over 300 cals. If you have some wiggle room in your diet, a nice weekend breakfast of carby comfort could be exactly what you need. Don’t Over Mix! 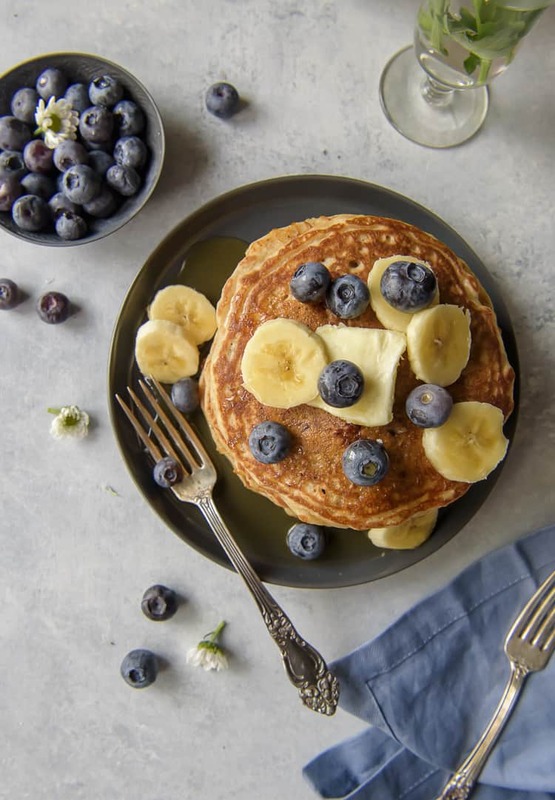 It is criminally easy to mix pancake batter too much – and the punishment is rubbery, flat pancakes that are only slightly appetizing. As soon as the clumps of flour blend into the batter, stop mixing! Heat It Up. In my experience, the most evenly cooked and perfect looking pancakes come off a 325-350 degree F griddle – electric or stovetop pan. Make sure the surface is evenly heated before cooking your pancakes. Butter Is Better. Non-stick cooking spray is fine when cooking pancakes, but why? Why use that when you can use butter?? Butter inside, butter on top – why not just sizzle them in butter, too? Leave Them Be. Resist the urge to flatten them with your spatula, unless you don’t like fluffy pancakes! Let them cook until the exposed side looks slightly dry, then flip them once. Pancakes from scratch are just as easy as using a boxed mix, and they taste so much better! First, grab two bowls, a medium and large. Whisk together your dry ingredients in the large bowl. If you’re feeling extra ambitious, sift it all together. Some people swear this makes their pancakes even fluffier, but I have yet to notice a difference. Use a rubber spatula to make a well in the middle of the dry stuff. In the medium bowl, whisk some eggs up until they’re fluffy, then add in your mashed bananas and remaining wet ingredients. Make sure everything is room temperature, and your melted butter is slightly cooled before mixing it in. This ensures it won’t solidify. Pour the wet mixture into the dry mixture and stir it up! But only until it’s just mixed – the more you mix, the tougher your ‘cakes with be. Heat a griddle to 325 degrees F and rub a stick of butter over the surface until it sizzles. Use a ladle or large cookie scoop and drop 1/4-1/3 cup of the batter onto the hot surface. Drop some blueberries on each pancake. Let them cook 2-4 minutes (your griddle may vary) until the top looks slightly dry, then flip them and cook another 1-2 minutes. Transfer them to a baking sheet in a low-temp oven to keep them warm while you finish off the batter. Can You Freeze Leftover Banana Pancakes? If you end up with extra pancakes (this recipe makes 12, so you might! ), pop them in the freezer! Abe LOVES finding leftovers waiting for him on his on-the-go mornings, and these reheat as good as if they were fresh. In a medium mixing bowl, lightly beat the eggs. Add the mashed banana, buttermilk, melted butter, and vanilla and whisk well to combine. In a separate large bowl, whisk together the flour, sugar, baking powder, baking soda, salt, and cinnamon. Whisk well. Use a spoon or spatula to create a well in the middle of the dry ingredients, the pour the wet ingredients in. Stir just until incorporated, being sure not to overmix. Heat a non-stick griddle to 325 degrees F, or set a large skillet over medium heat. Melt butter over the surface or spray with cooking spray as needed. Use a large ice cream scoop or ladle to pour about 1/3 cup batter onto the cooking surface. Scatter blueberries over the top of the pancake and cook until bubbles form on top and the batter is set and looks partially dry, 2-3 minutes. Repeat with the remaining batter, storing finished pancakes on a baking sheet in a 150 degree F (if desired) oven until ready to serve. Serve with sliced bananas, blueberries, butter, and maple syrup, as desired. 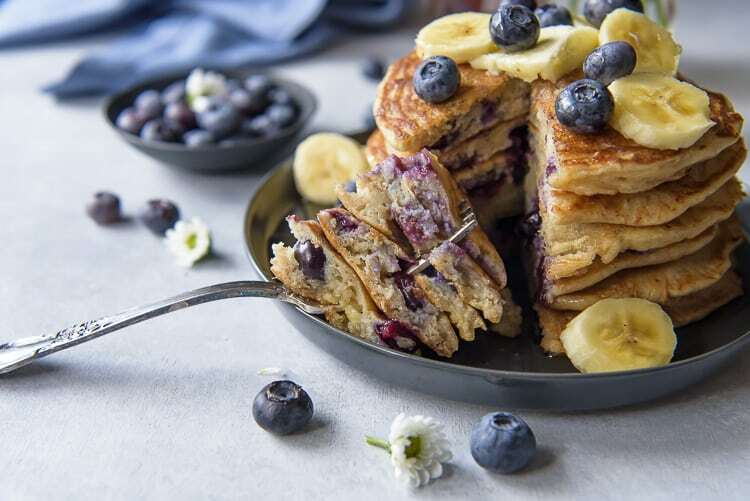 PIN THIS BLUEBERRY BANANA PANCAKE RECIPE FOR LATER!